Ah, the yearly phonomenon that is the Perseid meteor shower. Been meaning to watch for years, never got round to it. Until last Thurday, that is. And, I thought, I’ll get the tripod out and get some wonderful shots of the passing fireballs. 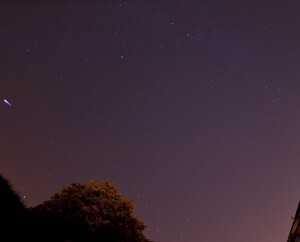 it’s a clear and near-moonless night, no rain and not too cold. Ideal! In over an hour, I got precicely ONE on camera. And quite a few aircraft going in and out of Luton Airport. Here’s the Single one caught on camera. It’s the white blob on the left. Not very impressive, is it? I gave up just before midnight due to excessive yawning. Oh well. At least I got to use the interval timer on the camera for the first time, and was therefore able to build a small movie of the resultant failing camerawork. Photos are HERE. Go have a look. There’s only 6, so no ploughing through tons! I have lots of memories of Bognor, as many years ago we used to have our family holidays just down the road at Pagham. Where there’s no life whatsoever. I was so bored I used to have to go fishing, it was that dull. Every so often, we’d meander down the road to get to Bognor, where there was some real *sand* on the beach, rather than the severe pebbles of Pagham. Not, frankly that it was much better, but still. So it was interesting to revisit Bognor after so many years – would it be, to quote HM King George V, “Bugger Bognor!”, or an interesting day out? It’s changed a bit. The old tacky and run-down seafront shops have been replaced by up-market flats. 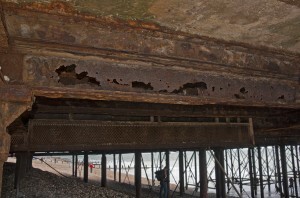 The pier’s still crap, and short. Especially after it had 24m hacked off of it a couple of years ago. And the beach is covered with a damned sight more pebbles than I remember. 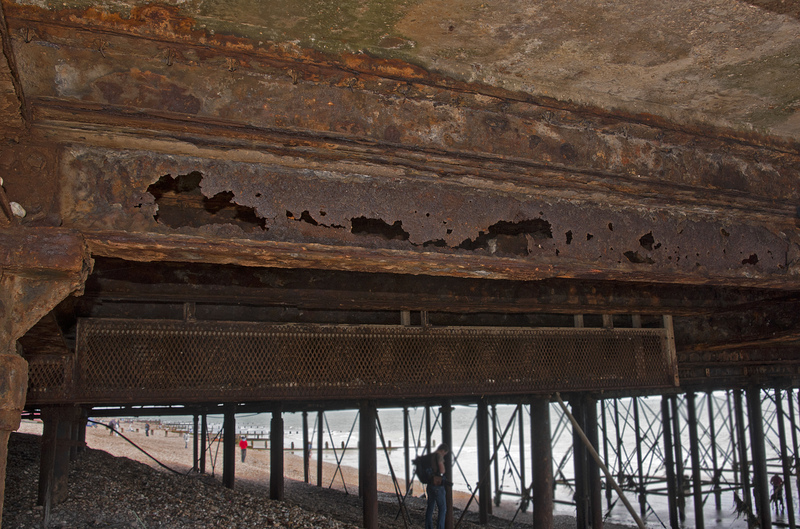 Not exactly inspiring you to feel safe on the pier, is it? But on the positive side, there’s some beach huts (all reasonably well maintained, only a few slightly deteriorating), plenty of space and Fish & Chips (as you do at the seaside, obviously). Today’s bonuses: A dead seagull in artistic pose, and a wedding couple having their photographs taken on the beach. And no, we didn’t go to Butlins. As you wouldn’t!